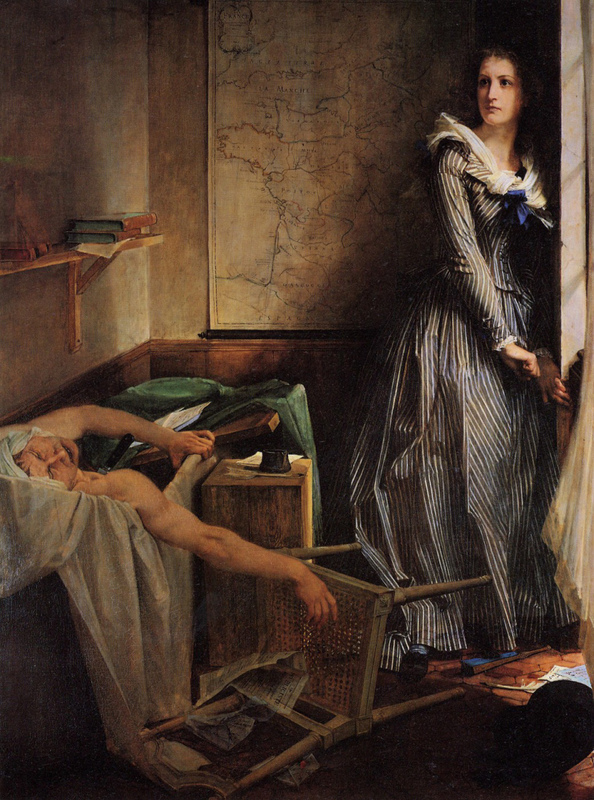 Adam Lux (as he’s better known, and a fitter name to his character could hardly be invented), German Republican turned French Revolution representative, was so lovestruck by the arresting figure of Charlotte Corday that it was downright … mortifying. 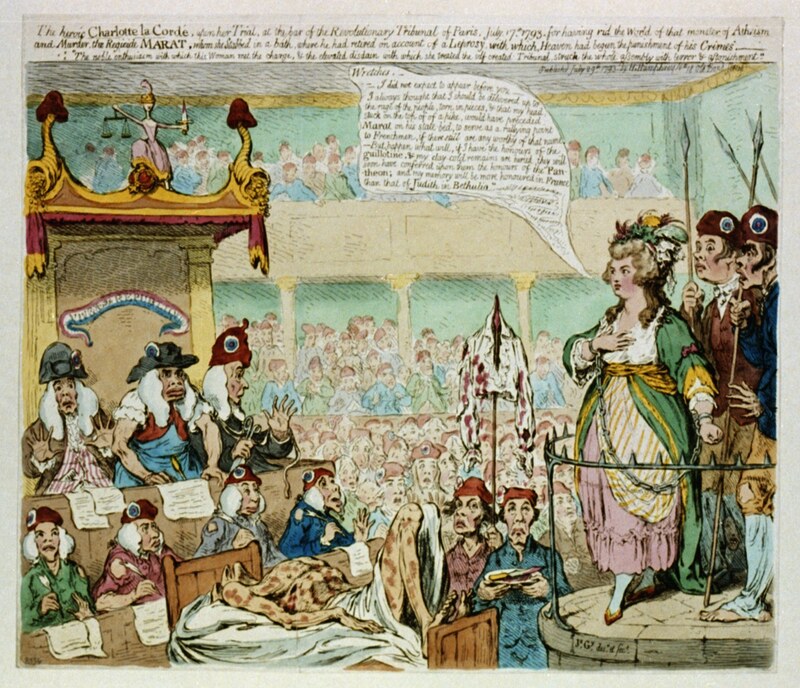 Many were men to whom the Norman maid played muse, like the poet Andre Chenier. But Lux was something else. Thrilled by this chaste heroine’s sacrificial blow against the Revolution’s monster, Lux was supposed to have fallen madly in love with the murderess the one time he actually saw her, on her serene way to the scaffold. Eros thus yoked to Thanatos, the besotted fellow promptly hurled himself after the exaltation of death. Imitation, after all, is the sincerest form of flattery. The guillotine is no longer a disgrace. It has become a sacred altar, from which every taint has been removed by the innocent blood shed there on the 17th of July. Forgive me, my divine Charlotte, if I find it impossible at the last moment to show the courage and the gentleness that were yours! I glory because you are superior to me, for it is right that she who is adored should be higher and more glorious than her adorer! Adam came off a little needy, you’d have to say. Not surprisingly, he didn’t get the girl in the end. And red on a land of blood rises the morning sun. But none in such red triumph as this that we behold. Queen of all roses thou, splendid and passionate. Passionate even as thine, the rose-flower of my heart. I answer thee look for look, I am warmed and comforted. Nursed on the bare bruised breasts of Freedom our great Mother! Come, O Rose, to my bosom, come when thou art dead! Signal me with your eyes that love still understands! I shall know thy blood-red raiment either in heaven or hell! Passionate even as thine, the red rose of my heart! On this date in 1794, proto-Romantic poet Andre Chenier went to the guillotine the unfortunate victim of his father’s love. 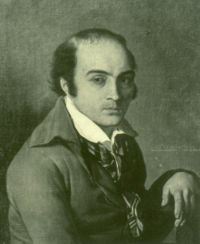 In the operatic version of this Istanbul-born poet‘s life story, Chenier is accused by a rival in love, convicted, and guillotined the next day together with his beloved Maddalena, who effects a Sydney Carton-like swap into the lot of the condemned in order to share his fate. Chenier’s real end was both more mundane, and far more tragic. 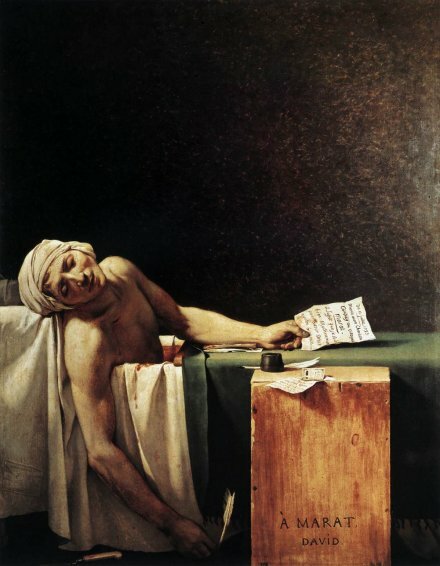 A revolutionary of the constitutional monarchist variety and an open opponent of the Jacobins bold enough to compose an ode to Marat’s murderess, Chenier had spent a year staying out of sight when the police picked him up almost accidentally. 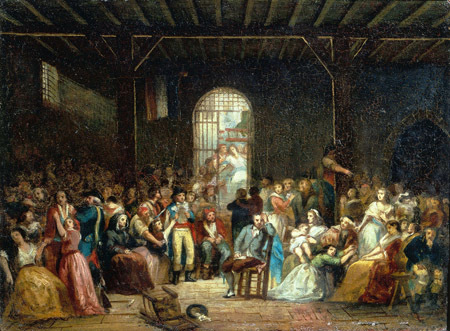 Prisoners suffocating in the Paris jails were suspended horribly between life and death, but the anonymity of this living tomb offered — as with Tom Paine — a measure of occasional safety. Mon beau voyage encore est si loin de sa fin! J’ai passé les premiers à peine. Though Descoings died, he had the honour, at any rate, of going to the scaffold with Andre de Chenier. There, no doubt, grocery and poetry embraced for the first time in the flesh; for they have always had, and will always have, their private relations. Descoings’ execution made a far greater sensation than Andre de Chenier’s. Thirty years elapsed before it was recognised that France had lost more by Chenier’s death than by that of Descoings. Robespierre’s sentence had this good result — until 1830 grocers were still afraid of meddling in politics. The salutary effect upon grocers has long faded, but Chenier’s reputation has steadily ripened like wine since his demise. And the title part of the late-19th century opera Andrea Chenier — however scant its resemblance to the man who inspired it — is one of the most gorgeous tenor roles in opera.